DofE Awards – Charmayne Fraser currently in S5 was presented with her Bronze Duke of Edinburgh Award at assembly. Former Head Girl Katrina Port and former Head Boy James Staddon have now received their Silver Duke of Edinburgh’s Award. Both completed the award before leaving school. James is currently in New Zealand and Katrina has started her studies at University of Glasgow. Former Pupil Success – We have been notified that Alexander MacDonald has graduated from Heriot Watt University with a MEng Computing and Electronics. Well done! If anyone in the community is aware of other success stories associated with former pupils please let us know. Remember we acknowledge success in many ways and the staff are pleased to hear how pupils fare after school. Universities write to us about former pupils as part of their own publicity campaign but we like to reflect the broad range of careers and activities that alumni take up. This information is added to our former pupil web page accessible from the front page of the school website. This site has the facility to leave a message or search for former pupils by name. S4 Prelims – Pupils in S4 have been working with their teachers preparing and planning for their exams which start at the end of November. Parents should be aware that these pupils should now be focused on these exams. They have been given appropriate materials for their subjects and advised about the steps they need to take to achieve their best grades. We would ask that parents support pupils in preparation for these important exams. Oxfam Water Week – Did you know that the average water usage for a person in Scotland is around 200 litres a day? Many people around the world have great difficulty in getting access to clean water for a variety of reasons such as natural disasters, conflicts and droughts. Thanks to Ms Velt and Mrs. Somers, S2 learned about water vulnerability around the world during their Global Citizenship classes. They also took action and organised a sponsored “water walk” as part of Oxfam’s “Water week”. The S2 pupils found out that carrying clean water (in our simulation, around the school playing fields) takes great effort and time and it prevents many young girls in Africa from going to school. S2 would like to thank all members of the community for donating so generously to this activity. So far over £400 has been raised to help communities in Mali install water pumps and allow girls to get an education. Ceangal Project – Seven Gairloch Primary pupils and one Advanced Higher pupil joined S3 and S4 Standard Grade Art pupils for an interesting project recently. It was part of the CEANGAL PROJECT which is being pioneered by Lynn Bennett-MacKenzie in collaboration with Somu Desai, an Indian artist from Valsad. Lynn and Somu came into the High School with several other practising artists for two afternoons, and worked with the pupils in groups. 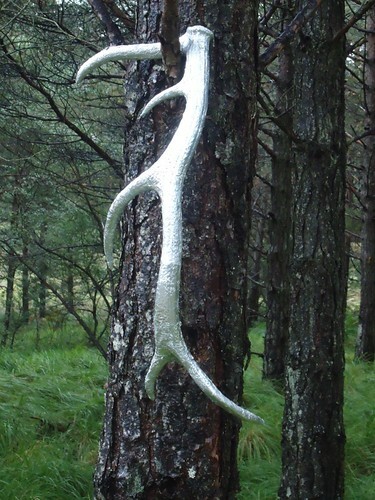 They used a range of found natural objects – bits of driftwood, stones, antlers, etc., to retain some aspects of their identity while changing others. On Wednesday morning, everyone travelled along to the Beinn Eighe Nature Reserve where they ‘installed’ their sculptures back into the environment. They make an interesting little exhibition and can be viewed at the Visitor Centre, as well as on the school website. 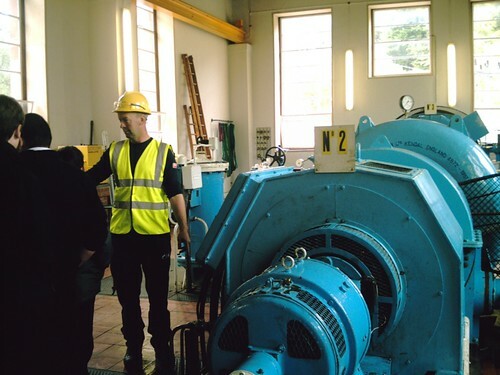 Kerry Falls – The S3 Technological Studies class got a guided tour of the local hydro scheme recently. The group started up at the reservoir and moved downhill towards the power station. Thanks to Mr. Gorman, Mrs. Fraser and Mr. Bruce Alexander for coordinating this interesting trip. S6 Leadership skills – The majority of S6 prefects took part in a two-day trip to the Highland Council centre at Badaguish, near Aviemore. 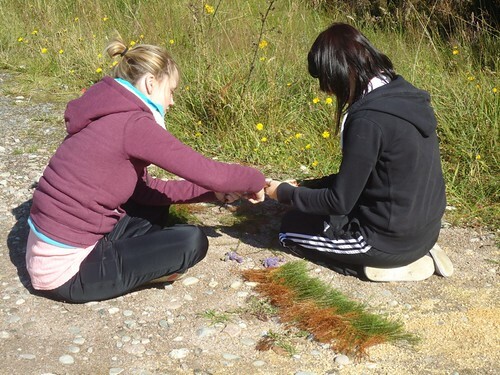 The purpose was to develop teamwork and leadership skills. Ms Gulliver and Mr. Johnston supervised the activities, which included outdoor artwork, mountain biking and kayaking. All the participants got a chance to lead and organise their peers. Visiting Author – S1-S3 are looking forward to meeting Lari Don, award-winning ‘Author of First Aid for Faeries’ on 30th September. Lari will visit for a talk about her popular books that are based in modern Scotland but influenced by old tales and traditional stories. Her books are now available to borrow as well as to buy at the library for £6 with profits going to ‘Jeans for Genes’, which we take part in on the day of Lari’s visit. Lari will also happily sign copies of her work on the day. Librarian Ms Hollenstein and Headteacher Mr. Port both wish to publicly thank the Parent Council for funding this event. Visit her webiste by clicking here. Focus on Cooking Bus Visit – On Monday 26th September an articulated pantechnicon will park up at the school for the week. This lorry is known as the Cooking Bus and will assist us to promote cooking skills, food safety and hygiene, healthy eating and enjoyment of food. On Tuesday all of S1 and a group of S6 will be cooking. After school 16 staff will take part. On Wednesday half of S3 along with all of S2 will participate. Finally on Thursday there will be another S3 session and the chance for S5 pupils to share the experience. Thanks to Mr. Milner for organising this visit to the school. Comenius Visitors – Since the summer of 2010, Gairloch staff and pupils have been working closely with four other European schools: Instituto Istruzione Superiore C Colgi in Italy, 7th General Lyceum of Illion in Greece, HS/RS Lehre in Germany and Preili State Gymnasium in Latvia. Two groups of Gairloch pupils have already been on successful trips to Latvia in October 2010 and Germany in April this year. Read more about the project on our website by clicking here. Starting the 2nd October groups of staff and pupils from our four partner schools will arrive here in Gairloch, where we plan a varied programme of events as their hosts. Our guests will stay with local families and throughout the week they will be involved in visits around the local area including Inverewe and an archaeology walk around Port Henderson. Culloden also features on the itinerary. The week culminates with a ceilidh in the Community Hall on Friday evening 7th October to which everyone is invited. The ceilidh will include performances by many of our own pupils and members of the community as well as our guests, who will depart the next morning. Gairloch Show – Congratulations to the current S2 pupils, who as part of their SMART course in S1, planted and cared for the onions that took 1st place, the leeks that took 2nd place and the courgettes (round variety) that also took a 2nd place at the Gairloch Show on Saturday 27th August. The prize money will go towards buying seed for next season. Congratulations also to Patrick Hill and John Scott MacLeod for their 3rd place in the baking section. Mr. Milner supported the work in school. 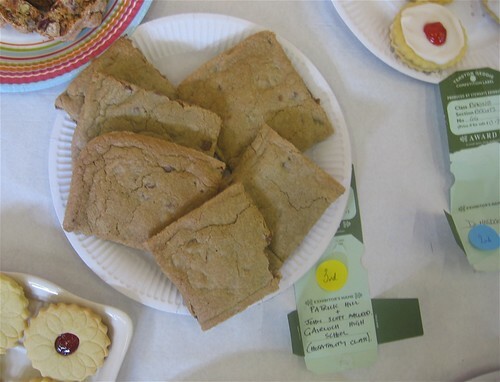 Photographs of the vegetables and some baking can be viewed here on the school website. 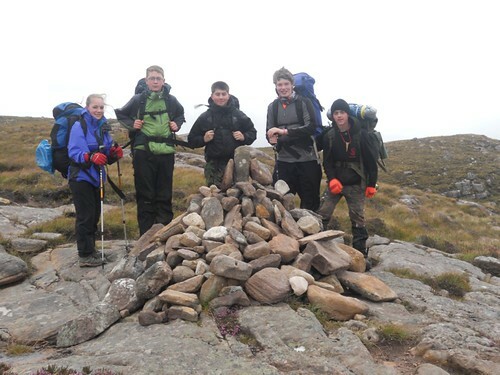 DofE Silver Expedition – Despite some unsettled weather, five S5 and S6 pupils and one former pupil (Carianne Johnston, Callum Vickerstaff, Gemma Urquhart, Ian Paul, David Roberston & Jake Bulmer) successfully completed their silver qualifying expedition on 30th August. Having walked from Redpoint to Achnashellach via Diabaig and Inveralligin over three days, the group were slightly tired and a bit sore on their arrival back at school on Tuesday evening, although one member of the group, at least, still had enough energy left to sing! However, the organised way they coped with each challenge they faced proved they are worthy of getting their silver award in the near future. A second silver group will hopefully undertake their expedition in the summer term. Thanks to Mrs Newman and the other staff who helped to supervise and assess this expedition. Photographs of the trip can be viewed here on the school website. Culture Club – Our first Culture Club outing for the new session took place on Wednesday 24th August. We had a full minibus and travelled to Eden Court to see Preston Reed, an amazing American guitarist with an extraordinary percussive style of playing. We were delighted to welcome seven new members to our group, all from S1 and S2 and pleased that, despite the late night, there were no absences the next day! Malawi Update PART 2 – Dr Caley visited out partner school in Malawi again during the summer holidays. Last issue Dr Caley explained how, with the help of Unicef, none of the pupils need now sit on the floor while learning. The teaching staff at Mlozi School continues to change – teachers in Malawi can be sent to a different school at very short notice, and it is common for this to happen. At the moment, Mlozi School has 9 qualified teachers and 3 auxiliary teachers, having received 3 newly qualified teachers earlier this year, a big change from the 5 qualified and 2 auxiliary teachers of three years ago. These teachers are responsible for around 1200 learners in 8 classes, with extra staff being allocated to the largest classes. Of course, this could all change again when their new school session starts this month. Earlier this year, pupils at Kinlochewe Primary School raised some money for an orchard of fruit trees at Mlozi School. When mature, this will enable the school to provide fruit for pupils and to sell fruit to raise money for the school. The learners have already cleared the site and, during Dr Caley’s visit, an agricultural advisor came to the school to tell them about cultivation methods and types of trees to grow. It is likely that the orchard will be planted towards the end of this year. During the visit, plans were also made for the joint projects to be carried out by pupils in Gairloch and Mlozi in the coming session. These are on the topics of human rights, health and the environment and are a result of our successful application for a Global Curriculum Project grant from Global School Partnerships through the British Council. This grant will also allow for more teachers to visit the partner schools and we hope that two more teachers from Mlozi, Mr Chabwera and Mr Maseko, will visit Gairloch later this year. Meanwhile, pupils in both schools, and in many of our associated Primary Schools, will continue to develop the relationship between the schools through letter-writing. This term, the theme of the letters will be the climate of our respective countries. You can read the whole article here on our special Malawi pages. Parent Council meeting – Well over 100 Parents, Staff, senior pupils and members of the community attended the High School on the evening of Wednesday 24th August to discuss the ongoing effect of budget cuts. Representatives of Education Culture and Sport attended and quickly realised the strength of feeling in the community in support of the school. Discussions will continue between Mr. Port and the Council, and with the continuing support of the Parent Council and the community, it is hoped that a plan can be agreed which allows the school to continue to deliver a strong curriculum for the children of Gairloch. Details of the meeting can be found on the Parent Council area of the school website. Thank you to everyone who continues to provide positive support for the school. The minutes are now available here on the Parent Council pages of the school website. Speed Caution – Those adults driving in the car park, especially in the morning and afternoon when children are arriving and leaving the Primary and Secondary schools, are asked to show extreme caution and limit their speed. Driving above 5mph in the car park area when there are children around is very dangerous. 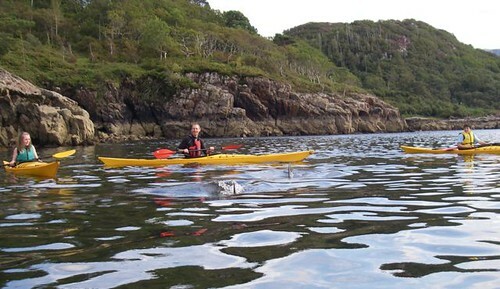 Intermediate Course Unit in Kayaking – Pupils taking unit certificates in kayaking had an exciting encounter with the dolphins in the harbour area on Wed 24th August. As part of their course assessment pupils have to record their experiences. Here are a couple of extracts about their encounter. 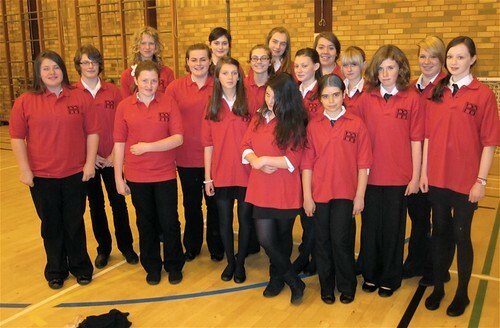 Fit for Life – All the girls received their polo shirt in house colours with associated logo last week. We are now investigating how we can raise funds to purchase shirts for the boys. View the photographs here on the school website.